This old John Deere mower has been sitting in our storage yard for a couple of years. 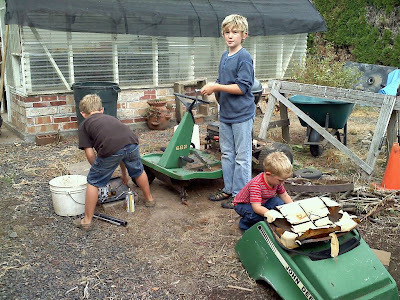 I got it from a neighbor with the idea that the kids could part it out and make a go kart out of the usable pieces. This week they started the project. So far it looks like the steering mechanism, the frame, and possibly the transmission will be usable. I already have an old Briggs and Stratton engine waiting to be bolted on. We'll keep you posted on the progress.